CLEMSON -- This time a year ago, all eyes were glued to Clemson’s spring game - but for different reasons. That April afternoon had a different tone, a different vibe than the 2019 spring game. Coming off a loss in the Sugar Bowl to eventual national champion Alabama, the 2018 spring game was about getting a fresh start with the freshmen pieces that are now household names across the country. Today? Well, Saturday was more of a victory lap. A friendly reminder of what Clemson was able to accomplish in 2018 on its run to a second national championship in three years. The score from Saturday’s glorified scrimmage was 30-10 with Team White taking care of Team Orange. But that was merely a footnote compared to the bigger picture surrounding the day in its entirety. This year, there was no glaring controversy that needed to be analyzed with every throw. No depth-chart hot takes. 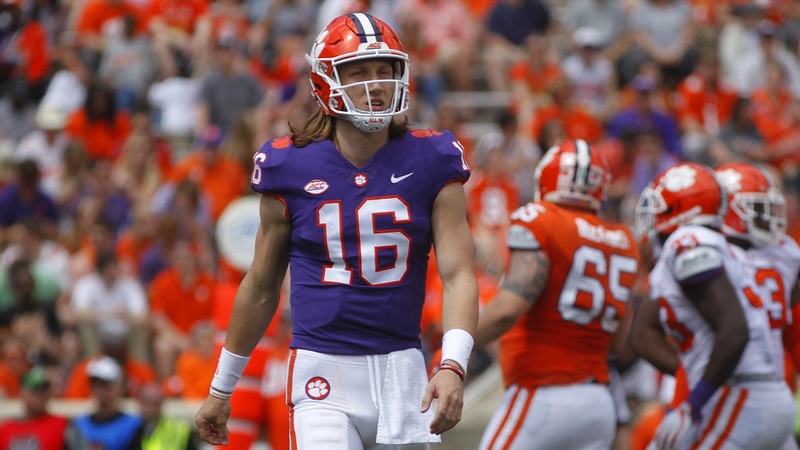 Only the roar from one of the biggest crowds this writer has seen at a spring game (60,000) as the Tigers tumbled down the hill for the first time in 2019. Only the smiles of Christian Wilkins, Austin Bryant, and Clelin Ferrell as they raced towards the student section in street clothes to fire them up one more time. Only Queen’s “We Are The Champions” playing numerous times over the Death Valley loudspeakers. Sure, there was a football game played on Saturday, which will surely bring a lot of evaluation going into the summer in the coming weeks. But there was also plenty of celebration and moments that could have triggered quite a few memories from Clemson’s 15-0 season. Moments like Justyn Ross snatching the ball out of the air with one hand and Derion Kendrick draped all over him for 32 yards. It was a play reminiscent to one of the few gigantic grabs Ross made in the national championship game with such ease. “(Ross) is one of the best I’ve been around,” Dabo Swinney gleefully said afterwards. Or when Chase Brice, who finished with 165 yards passing on a 10-for-19 clip with one touchdown, led an 8-play, 95-yard touchdown drive to give Team White the first points of the game. The drive resembled the 94-yard touchdown drive he led in the final minutes against Syracuse to keep Clemson’s undefeated record, and Playoff hopes, alive. Or when Trevor Lawrence rolled left and fired the ball with such ease to find freshman Joseph Ngata, barely keeping his toes in bounds, for 31 yards. We’ve seen Lawrence make that kind of throw look so comfortable before, but every time we see it again, it’s as if we're seeing it for the first time. But Saturday’s contest between the lines wasn’t only about reminding people of the weapons that Clemson already has on offense. There was a showcase of players in new roles and our first look at the gobs of talent this year’s freshman class possesses. Ngata and that Frank Ladson Jr. kid? Pretty damn impressive. Both were on separate teams and both delivered as each receiver led their team in the receiving category. Ladson had five catches for 102 yards. Ngata: five catches for 127 yards. There’s a reason Swinney called those two players some of the most “ready-made” freshmen he’s seen earlier this spring. Even with Amari Rodgers out for the season with a torn ACL and Diondre Overton being held out of the spring game due to an injured knee, you barely bat an eyelash after today given the talent level Clemson has at that position. On the other side of the ball, freshman cornerback Sheridan Jones flashed and took advantage of the spring game stage. He took on the challenge and held his own against Tee Higgins. Jones had seven total tackles, forced a fumble, and took a Ben Batson pass back to the house late in the game to give Team White the comfortable 30-10 victory. Then there was our first look at Derion Kendrick playing on the defensive side of the ball at cornerback. And he looked like what Swinney and Brent Venables had told us all spring since he started playing that side of the ball: a natural. Kendrick held his own against Ross even after the tremendous catch in the first half. He was in solid position and looked like the five-star athlete Clemson recruited. But the moment of the afternoon came at halftime when the seniors in attendance received their national championship rings. A video played of the ring’s creation from scratch intertwined with highlights of Clemson’s beatdown in the Bay Area against the Crimson Tide. Swinney gathered his team around the seniors who stood in front of their ring boxes and gave a speech that only Dabo Swinney could do justice. He urged the crowd in attendance to not take moments like these, or seasons like 2018, for granted. Then came the mic drop heard around the country that served as a reminder of the greatness of the 2018 senior class and a not-so-friendly reminder to the rest of college football. According to Swinney, the moment was purely spontaneous. The crowd went wild. The class opened their ring boxes. And the celebration that was Saturday’s spring game continued into the evening. There’s a lot to unpack from the game and the entire spring as a whole. The staff will make all the evaluations it needs to in specific areas as the team transitions into summer skills-and-drills. But the overarching feeling of Saturday itself was more of a commemoration of what Clemson has already accomplished by going 15-0. And a reminder of what Clemson currently has on the table - an extremely talented group hungry to make another run. One final reminder: Clemson will open its season at home on Thursday night, Aug. 29, against Georgia Tech. And we can hardly wait. Great work. Loved watching the game this past weekend. Can you say SHOWCASE?! ?